VIGO COUNTY, Ind —Tuesday morning just before 11 a.m. Indiana State Police Master Trooper Chip McKee drove up on a two-vehicle crash in the northbound lanes of US 41 (3rd Street) at Hulman Street. Police say that a black 1998 Dodge pickup, driven by 44-year-old Michelle Heidelberg-Bauer of Shelburn, IN., was southbound on US 41 and attempting a left turn to proceed east onto Hulman Street when she was hit by a blue 2015 Chevrolet Malibu, driven by 69-year-old Marita Shelton of Palestine, Illinois. 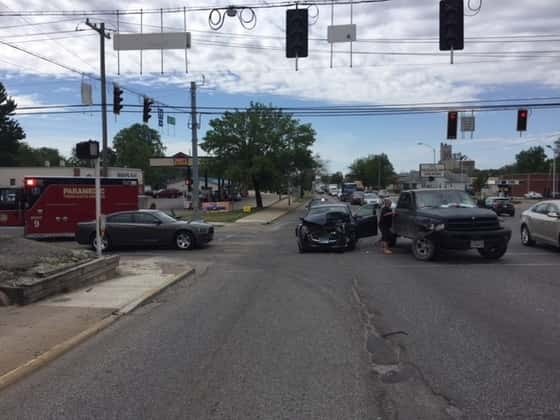 Police say that Shelton failed to stop for a red light for northbound US 41 at Hulman Street. Shelton was taken to Union Hospital for minor injuries and was cited for disregarding an automatic signal.